Apple Tablet: Is it the iSlate? the one we don't officially know exists yet -- will be called the iSlate. There seems to be plenty of evidence that Apple's interested in that name, but that's not definitive proof that the tablet will get the moniker. It might just mean that Apple's preemptively taking steps to prevent anyone else from using it. could use a different term that you've trademarked, so you don't find yourself competing with knockoff "slates?" 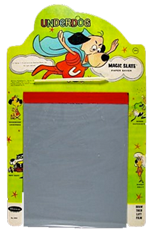 Oldtimers like myself will remember other examples of the use of "slate" as a synonym for "tablet" -- most notably Slate Corporation, an early-1990s company that made applications for Microsoft's first failed tablet platform . . . This story, "Apple Tablet: Is it the iSlate?" was originally published by Technologizer.